We investigate the impact of the Canada-Chile Free Trade Agreement (CCFTA) on Canadian exports to Chile, particularly the dynamic effects of the agreement on extensive and intensive margins of trade. Consistent with the literature, we find that the extensive margin effects occurred later than the intensive margin effects and became more prominent in the long-term. Surprisingly, the intensive margin effects died off in the long-term. A theoretical model is constructed to show that our results can arise in a standard setting of intra-industry trade. Chen, Z, & Voia, M.-C. (2017). 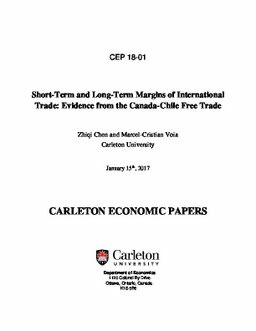 Short-Term and Long-Term Margins of International Trade : Evidence from the Canada-Chile Free Trade Agreement (No. CEP 18-01). Carleton Economic Papers (CEP). Department of Economics.